current at time of transmission and subject to change without notice. All prices are in U.S. dollars. Government taxes and fees are additional. Certain restrictions apply. Cruise lines reserve the right to impose a fuel supplement on all guests. Starting today you can move up in the world with a free category upgrade during our Wave Upgrade Event. Visit Europe to explore historic and romantic cities, snorkel in the clear blue waters that surround Great Stirrup Cay, our private island in the Bahamas. Or learn to surf in Hawai`i. So pack your bags and sense of adventure and get ready to See the World the Norwegian Way™. 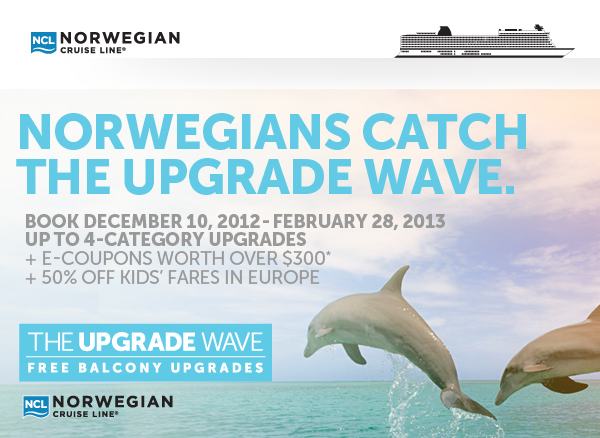 Simply book on a Norwegian cruise vacation before February 28, 2013. Hurry, the best upgrades go first. Offer: Reduced deposit plus up to a 4-category free upgrade plus E-Coupons worth over $300 for ships/sailings embarking on or before 12/31/13, delivered with e-documents. Program code: 13WAVE. Program code: UPGRADE (online booking engine SABRE only). Terms and Conditions. Promo Code: 13WAVE. Free upgrade refers to a better available accommodation within the meta (i.e. Interior for the price of a lower Interior category or Oceanview for the price of a lower Oceanview category or Balcony for the price of a lower Balcony category or Mini-Suite for the price of a lower Mini-Suite category). This promotion will also include upgrades across meta categories. This will be an oceanview for the price of an inside, a balcony for the price of an oceanview, or minisuite for the price of a balcony. Excludes 1 and 2 Day Sailings. Offer based on a first come, first served basis. Offer is subject to category availability. Upgrade varies per ship, sail date, category booked. Offer excludes Studios and Luxury Accommodations. Reduced deposit available during booking window outside of finalization. Reduced Deposit is 50% off standard deposit. Reduced deposit does not apply to the Haven and Suite categories. Offer is for New Individual FIT Reservations Only. Qualifying New Individual FIT reservations can be moved into existing Group and count towards Tour Conductor Credits. Offer is NOT combinable with existing group block rates. E-coupons will only be valid for ships/sailings embarking on or before 12/31/2013. One E-coupon booklet per reservation delivered with e-documents for reservations booked within the booking window. Guests who cancel and rebook must accept this promotion's Terms and Conditions. Government taxes, fees and onboard service charges are additional. Not applicable to CM&I, Charters and INCREG and INCLARGE IMPORTANT NOTICE: Norwegian Cruise Line reserves the right to charge a fuel supplement without prior notice should the closing price of West Texas Intermediate Fuel increase above $65 per barrel on the NYMEX (New York Mercantile Exchange Index). In the event a fuel supplement is charged, Norwegian Cruise Line will have sole discretion to apply the supplementary charge to both existing and new bookings, regardless of whether such bookings have been paid in full. Such supplementary charges are not included in the cruise fare. The fuel supplement charge will not exceed $10.00 per passenger per day. Offers are based on availability, are capacity controlled and apply to selected sailings. Offers are subject to change and can be cancelled at any time per Norwegian Cruise Line's discretion. Other restrictions may apply. Combinability with other offers is subject to change and can be cancelled at any time per Norwegian Cruise Line's discretion. Promotion valid for NCLMIA and NCLINTL. Not available for CE and UK offices. Norwegian is not responsible for typographical errors or omissions. Ships' registry: BAHAMAS and UNITED STATES OF AMERICA. ©2012 NCL Corporation Ltd.